I am leaving today for Texas...teaching at The Crafty Scrapper this weekend, visiting my sister in Fort Worth during the week, then flying to Houston to be at Quilt Market. I've had much to accomplish before I go. So when I got the new colors of Distress paint last week, I had to just let them sit on my desk (staring at me) while I worked on other stuff. Today I decided it was time for a test run. I mean I couldn't leave home without testing out the colors, right? I started today's project by cutting a frame from Grungeboard using the Sizzix Postage Stamp Frame (with a Sized Rectangle in the center) so the center will be cut out. I painted the frame in Iced Spruce and let it dry. Once dry, I used a small flat paint brush to paint the edge of the frame with Ranger Adirondack Dabber paint in gold. After that layer dried, I painted on a quick dry glue. 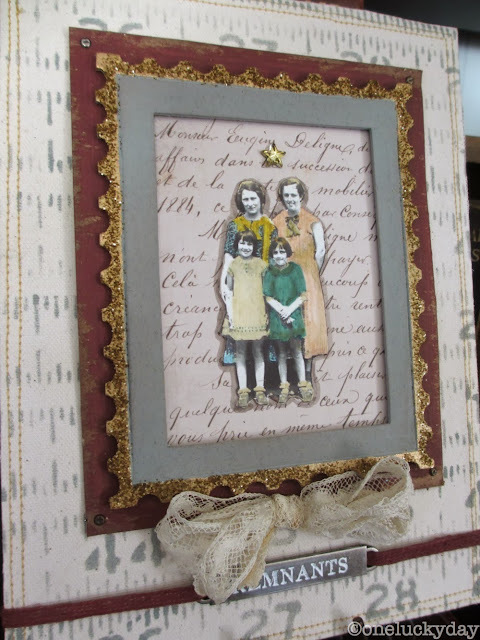 I used the glue sparingly as I wanted the gold paint to show through the Tarnish Brass Distress Glitter, like the frame was worn over time. If you want a thick Glitter coverage, just use Glossy Accents. Again, set aside to dry. I painted a piece of chipboard with the Aged Mahogany and sanded the edges of the chip with the Sanding grip. Inked the sanded edges with Frayed Burlap Distress Ink. When I participated in Creative Chemistry 102 last week I created a card that featured Photo Tinting with Distress Markers. I used the same photo I printed at home using an ink jet printer on matte photo paper. The photo is of my grandmother, two aunts and my mother (green dress). Here I added some paper from the French Industrial paper stash and then the colored photo. I added the drop shadow with the pumice stone marker. Next, I added the frame with foam tape over the center picture. I cut a piece of heavy weight board for the foundation. Then I cut a matching piece of Sticky Back Canvas and stitched around the edge. 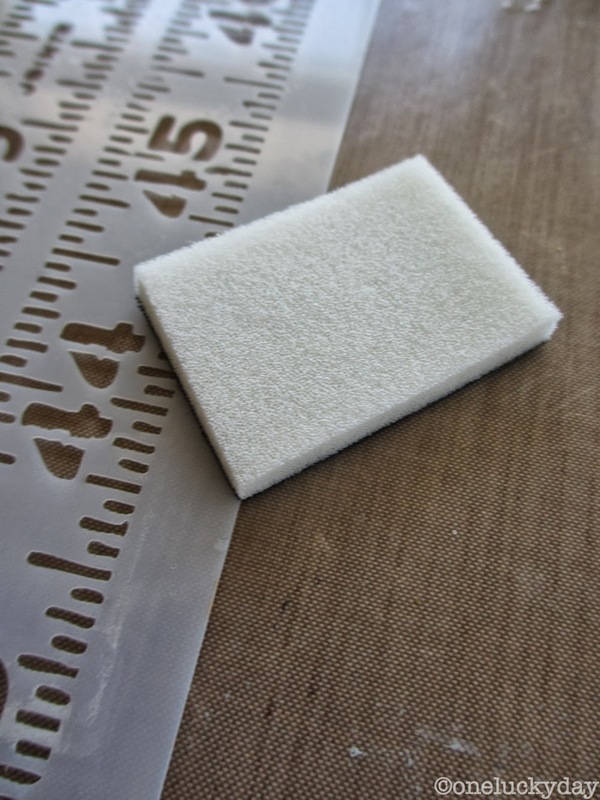 When I was finished stitching, I glued the Sticky Back Canvas to the Heavy weight board. I wanted to add more texture...this time visual texture. 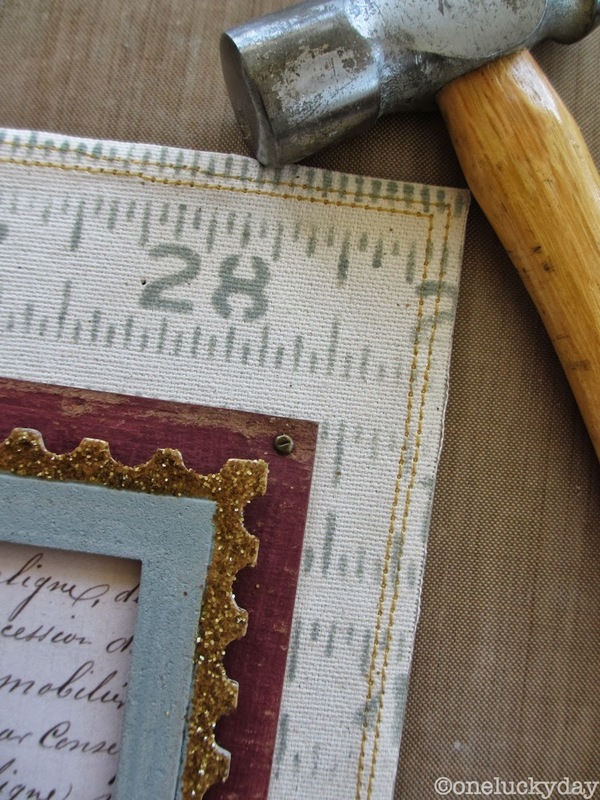 I used the Layering Stencil Measured and Iced Spruce Paint (on a blending tool). Super easy to do, add paint to the blending tool and just pounce over the stencil till you like what you see. Love how that paint turned out over the Sticky Back Canvas! Remember to clean your stencil right away....and the foam pad? just wash that out too and it's ready to go for another day. Yes, that is the same pad that was full of Iced Spruce just a minute ago. I added Mini Fasteners on each corner. They do not go through the entire board, only the chip. I used my ever trusty hammer to sink them into the chip just a little bit. Makes them look like they really go through the board. I think my hammer my be my 'go to' craft tool for the week. First the flowers and now the mini fasteners. My dad would be so proud. A bow made from some french lace and a Word band secured to the foundation with Linen Ribbon (I colored it with the Aged Mahogany Distress Paint). I did add a tiny Mirrored star colored with Alcohol ink and that really finished it off. I admit I wish I had wrapped the Linen Ribbon around twice but no time to fix that today. It will have to do till I return home. How would you like your own set of the new paint colors? Well, I'm giving one away. Please leave a comment - tell me your favorite new color! I will pick a winner on Friday the 18th and post the name on Saturday morning. comments are closed for this prize, thank you all! I think the Evergreen Bough is my fave! I love how this piece turned out, so pretty! Thanks for the tutorial too! Enjoy your trip and time spent with your sister. Oh, Evergreen Bough - LOL! You have me loving that iced spruce though just looking at the paint samples the stormy sky is right up my alley! Wow--this frame turned out great! Would be great as a gift too! Evergreen Bough really catches my eye! Thanks! I'm loving the Aged Mahogany, just reminders me of Christmas. 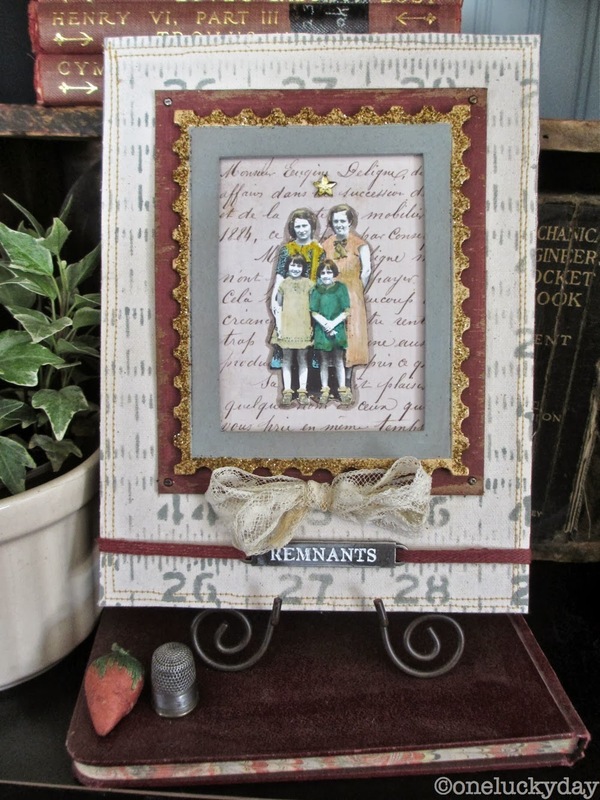 Love the frame!! My fav is aged mahogany..such a lovely deep rich color! Thanks for sharing the tut. PS - did you know your comment log doesn't work with Firefox? I think if you switched it to a popup comment box it would work. So pretty, love the layered treatments and textures! What a great piece! These colors are wonderful too, I'm torn between festive berries and evergreen bough. Thanks for the chance to win! Cute cute as always! Looking forward to reading my name. I'm feeling lucky! I love the paints. Iced Spruce is definitely my fav! Love the card especially the sticky back canvas with the stencil! Have fun in Texas! It may be Festive Berries ... but I am pretty sure I will like them all. Equal opportunity lover of colours. I love the festive berries! All these new colors are great! SO pretty. The festive berries is great. I can see it on Christmas and valentine projects. Festive berries! Love the bright red! Such a great tutorial with fun techniques! Thank you! What a hard decision to make, they are all wonderful - perhaps evergreen bough is slightly top of my list! What a gorgeous piece, love it. My favorite color is pine needles and I would love to win a set. Thanks so much for the chance to win. Paula I love all you create! I think Festive Berries is my favorite, no wait Evergreen Bough, no Iced Spruce....oh darn do I have to pick just one???? I see I'm not alone in my love of festive berries. Iced spruce is pretty too! Evergreen Bough...just finished watching Tim drool over it in CC102. If I have to pick one it'd be Festive Berries! 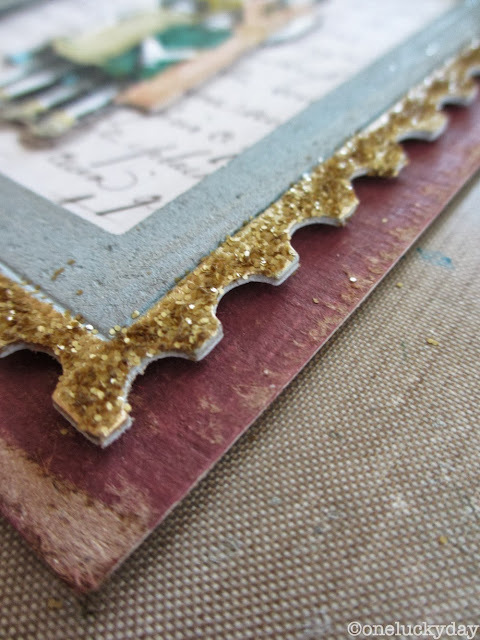 The gold glitter is such a pretty touch on your frame. Thanks for sharing! I love aged mahogany. It's one of the best reds. Love it for the holidays. thanks as always for sharing. Hmmmm... pick one fav of the new colors...that is a hard one. Probably "Iced Spruce" but I must say I think they are all wonderful colors! you are so creative...such neat ideas! I really like festive berries; thanks for the chance to win something! Second pick would be Evergreen Bough. As always your tutorials are great. Thanks for taking the time before a big trip. Aged Mahogany is one of my favorite inks, so I'm sure it will be a favorite...but that Iced Spruce looks amazing stenciled on the canvas! I'm loving Stormy Sky, but I'm a sucker for anything blue. ah, miss gypsy...we just drove through Keller on our way home from the airport. Small world. My sister is crafty but not really scrapbooking but good to know there is some one in the area supporting our industry! One of my favorites - Festive Berries! Whether it's Valentines Day, July 4th, or Christmas Holiday, it works in any project all year round! I'm really liking festive berries and iced spruce. Festive berries is my favorite! Thanks so much for the tutorial! What a great project and tutorial. Love the richness and versatility of Aged Mahogany, but the Iced Spruce would be a close second. Love all of the new colors. Love your project!!! My fave color is Evergreen Bough - at least for the moment. all of the colors are fabulous. Well, all of the colors look amazing, but the Iced Spruce is calling my name! Love how your project turned out! this is just about the coolest thing i've ever seen. ever. your tutorial was so easy to follow and the result was pure genius. the color? aged mahogany--it seductively whispers. it's all things deep and mysterious, yet aged and wise. My favorite is the Festive Berries! Love it! Mine is pine needles!! I love your blog-wish I could be half as creative! My favorite is Festive Berries! Great frame. Love that tarnished brass glitter. My fav new color paint is the festive berries followed closely by the evergreen bough. Thanks. Stunning, Paula! What a lovely keepsake for the upcoming holidays. Having to pick I'd say Evergreen Bough and Aged Mahogany are my favorites. Have fun on your trip and enjoy your time with your family. Thanks for all you do! Love the tutorial, thanks for the chance to win the paints. I am living too far away for this give-away to be pleasant ( the delivery will cost you too much) so please don't count me in... but I wanna say that I read each and every post of your blog. I learn and I learned so much from you. And that makes me really happy. Thank you . What a fantastic project. You always have such great and easy to follow tutorials. I love the festive berries. I liked the stenciled numbers on the sticky back canvas and the way you aged and edged the mahogany with frayed burlap...! What a great gift idea for the holidays, Thanks! I loved the evergreen bough and festive berries. WOW! What a beautiful piece and thanks so much for sharing how you did it. Some good ideas here! Using a picture of your family makes it even more special. it is hard to pick a favorite DP color, but since I'm in a blue-phase, stormy skies is it for me for now. although the evergreen bough, aged mahagoney and festive berries are calling me as well! Your project is flawless!! I love all of the colors but my absolute favorite is...ICE SPRUCE!!! Love your project once again, Paula. While I must have ALL of the new Distress Paint colors, the one I am most looking forward to using is Stormy Sky. It is one of my "go-to" colors in the rest of the Tim Distress colors and I know it will be one of my most used Distress Paints. Right up there with my Vintage Photo Distress Ink pad!!! ;) Have fun in Texas y'all! Iced Spruce is a new favorite of mine and I love the way it looks on the sticky backed canvas! Beautiful project! 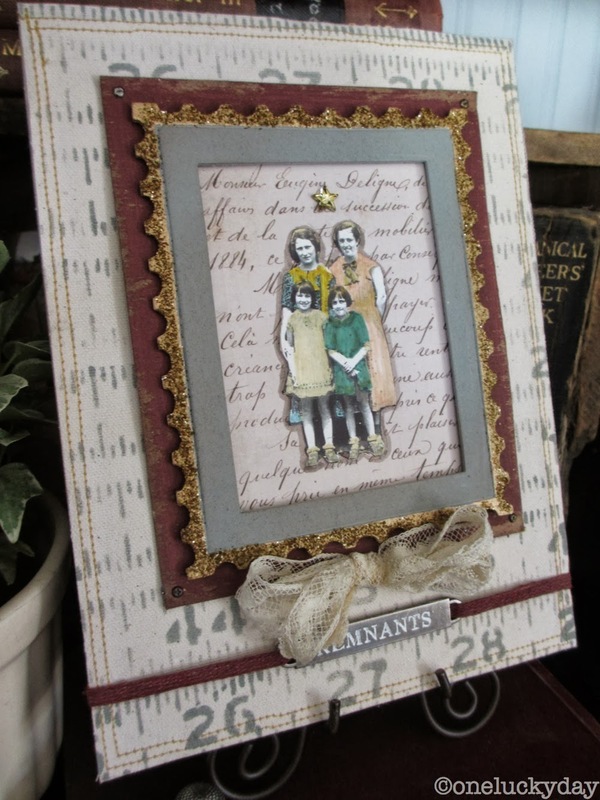 Oh my, The new release colors of the Tim Holtz Distress Paints are on the very top of my want list!!! Seeing your gorgeous frame makes me want them even more. I love it!! Thank you for an awesome giveaway! Beautiful project, beautiful paint! Looking forward to Evergreen Bough so I can experiment with the Eroded Metal technique from Creative Chemistry 102. Thanks! Love, Love the Aged Mahogany. You have such great projects on your site! I look forward to seeing new ones when you return. How can one have one favorite color? just one? I love all colors and how they look together and bring to the eye's visual nourishment. This is a wonderful project. Love the colors and I would love to win some of those paints for myself! Thanks for the chance to win. Evergreen Bough is my favorite of the new colors. Iced Spruce has to be my favourite colour. I love the grey tone that is perfect to compliment a project when Black Soot is too dark. I bought the Iced Spruce Distress Glitter as soon as I could!!! Thank you for the chance to win the lovely new colours. my favorite new color is the aged mahogany. thanks for the giveaway. My fave is Evergreen Bough!!! Love, love, love this colour! The frame is lovely, thanks for the inspiration. I love the subtleness of iced spruce, but the festiveness (!!) of festive berries! Your framed project is just amazing. Thanks for the chance to win. I like the colors Iced Spruce, Pine Needles and Stormy Sky. Thank you for the beautiful project. You make everything seem so easy to do and think that "Why didn't I think of that?". Thank you again. I love your project and the colors. Really like the aged mahogany. Again your project is so cool! Evergreen bough is my fave . Loved your project !!! Of course , wonderful work as always! you are very ispirational for me, i love your style and the way you create art! What a treasure your framed artwork is! I'd love so win some paints. Thank you for giving us a chance to win some. Chipped Sapphire would be my heart's desire! Salty ocean is my favourite at the moment, I am trying to create something with a blue theme but only have thoughts in my head, I adore your work thank you for sharing your ideas. My new favorite T!m product is the Distress paints. They are so fluid and easy to use! Probably my favorite color, right this minute, is Evergreen Bough. It makes me want to get started on those Holiday projects. I love them all but if I have to pick one it would be festive berries!!! Well, I think the Aged Mahogany but what a decision! Paula, I hope you have a great time in Texas. Thanks for all the sharing you do to make my life easier and happier! All of the colors are beautiful, but I especially like Aged Mahogany. My two favorites are Iced Spruce and Aged Mahogany. These are go to colors for me always and I am so happy they are now available in the Distress Paints. Oh, Paula, they're all so nice, but I think I like the Iced Spruce best. Thanks for the great tutorial. Have fun in Texas! My favorite is Aged Mahogany. So happy to have these additional colors available in the distress paints. I'm really drawn to blues lately so Stormy Sky is my favorite but that could change tomorrow. Love your project! Thanks for sharing all the steps on how you created it. My fave? It would have to be Iced Spruce. I LOVE that color! My favorite color - Iced Spruce. All of your projects are so beautiful - thanks for sharing your ideas & expertise! My favorite has to be festive berries although I love them all. Your project is wonderful and thanks so much for the chance to win! Evergreen Bough is my favorite of the new release. Thanks for the chance to win! I don't own this new set, but I really like how Evergreen Bough looks. Have a good trip! Wonderful project! If I were picking a favourite it would be Festive Berries, but the others needn't feel sad because they won't get left on the store shelf either! Awesome project! Love them al but if I had to pick one it would be Aged Mahogany. oh, i love all those colors. your project is beautiful. thanks for the opportunity to win some.